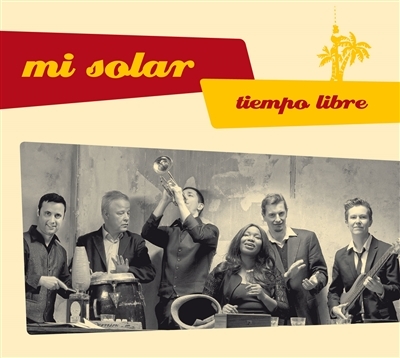 The love of Salsa music brought the band Mi Solar together: 6 musicians based in Berlin coming from Germany, Cuba and France. With a great mixture of Salsa, Timba, Funk, Hip Hop, Latin Jazz and catchy Pop elements Mi Solar represents Berlin-Cuban elegance. And with this rhythmical melange they surely know how make you dance! The band name is inspired by so called „solar“, which is the typical Havana courtyard. It's a place of pulsating life, joy and musical happenings. On their third album Mi Solar has developed their musical tradition further to fuse Salsa with different musical styles. They keep their distinctive sound but anyhow break through with new musical influences. That is maybe because drummer Walter Martinez is involved as a composer for the first time. While Jotham Bleiberg, Mayelis Guyat and Maike Scheel influenced the band's music on the previous albums Walter Martinez now introduces traditional, Cuban, Funk and Reggaeton elements. Except the song “Berlin City” all songs are original compositions. In “Berlin City” Maike Scheel praises her favourite town and wrote a special arrangement for it. The soulful singer Julie Wolff sings in German and gives the track a thrilling touch. The different tempi, styles and moods of the album take you on a exciting musical journey: On the one hand there is the romantic “Yo no se“ which is sung by the guest singer Yamil Borges, on the other side there is the song “La Pista“ which features a rap in a typical US manner by Chanel Green. And of course the typical positive and joyful Mi Solar Timba songs like “Tal como somos“ are included on the new album: Once again Mi Solar's front singer Mayelis Guyat sings with a haunting voice and is accompanied by a perfect band. In the song “El Cuento“ Mi Solar worked together with lyricist Rafael Hernandez. The onomatopoeic lyrics are inspired by the oriental fairy tale of Scheherazade. Oriental meets Timba - what an extraordinary mixture! The new album “Tiempo Libre” by Mi Solar stands out with a brilliant brass section, a thrilling groove, haunting Jazz piano sounds and catchy pop structures. It is not only a gift for the Latin dance community but for every lover of excellent Latin music. This is the Cuban way of partying!